How to stay fit on the road was not at the top of my priorities before we started our perpetual round-the-world journey. Rather naively, I imagined that exercising while slow traveling should be a piece of cake. Due to our digital nomad lifestyle, the internet connection is necessary. Hence, we could not venture too far into the wild, but would stay within more-or-less civilized places where finding a gym or a pool should not be a problem. Our inaugural stop was in Chiang Mai, the self-proclaimed digital nomad capital. Actually, that was the reason why we started there. We were convinced by glowing reviews and first-hand accounts of how CM is the perfect place to work online enjoying all modern conveniences at the fraction of Western costs. Indeed, our apartment complex had a pool and a small gym directly on the premises. Perfect! Unfortunately, I quickly discovered that hygiene habits of some visitors were rudimentary at best. Shower before jumping into the pool? Wipe the gym equipment after a sweaty workout? My imagination went into overdrive picturing what kind of exotic ailments one might pick up there. Was it an overreaction? Who knows but it was enough for me to stay away from these facilities. The easy road hadn’t worked. It was time to take it more seriously and do some homework. I am not a fitness buff. Building a six pack or competing in a bodybuilding competition is as alien to me as gardening. During my pre-traveling years, I enjoyed cross-country skiing and bicycling. Nowadays, limited to just a single travel bag for all my possessions including tech gear, those are no longer feasible for practical reasons. In consequence, hiking came to the rescue. With weekends and vacations covered, what about an everyday routine? 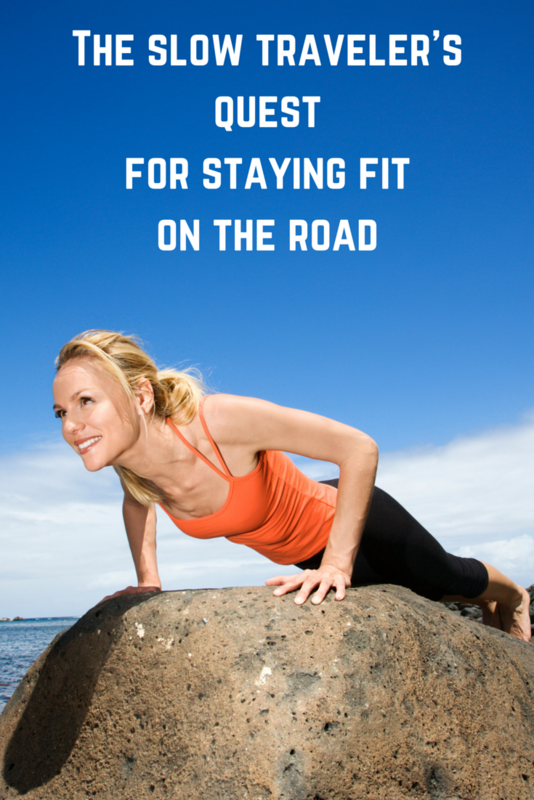 Search results for a very generic “staying fit on the road” query were discouraging at best. This is one of these perennially popular topics that generates the endless stream of recommendations and opinions. There was no sane way to process that bottomless pit of information. I had to come up with a list of goals first to refine my search and get more relevant results. I had a fairly good idea of what I was looking for. However, there was one detail that initially escaped me. I am a person of habit. When we moved from place to place, I realized that I have to come up with a fitness routine that is independent of my geographical location or current living conditions, or whatever else might change every 3 months. Another important point was that I was not looking for a weight loss program per se. Admittedly, I could lose some pounds, but I am fairly comfortable in my skin. The solution came from an unexpected source. One day, I was reading an interview with Helen Mirren. It was just the usual promo piece about some of her new movies, but one of the questions was about how she manages to stay in such a fantastic shape. She said that she swears by a 12-minute workout invented by the Royal Canadian Air Force (RCAF) in the 50s. Just 12 minutes? I was intrigued to the point of doing some further digging. The RCAF fitness plan was developed to improve fitness in military pilots posted to remote air bases without gym facilities. The men’s routine consists of five simple activities: stretching, sit-ups, back extensions, push-ups and running on the spot. The women’s version has 10 exercises. As fitness increases, so too does the difficulty of every exercise. However, crucially, the length of time stays the same. Essentially, this program was the original high-intensity workout, which was largely forgotten. Decades later, it was reinvented, repackaged as “Interval Training” and marketed as a brand new innovation. Apparently, it was a big hit half a century ago. RCAF published this plan as a booklet, which became the international bestseller with 23 million copies sold in 13 languages. there are (or, were at the time I did my research 15 months ago) a number of websites explaining the routine and providing training details. They are not affiliated with RCAF. Some websites managed to provide quite convoluted explanations of program’s diagrams and charts. Out of all, I picked fit450.com simply because it had the easy to follow information about this fitness plan. First couple weeks were surprisingly challenging and filled with muscle ache and regrets. By the end of the third week, I was hooked. 15 months later, it is a part of my daily routine. I would love to walk more during the week, but it is too time-consuming to do more often. Plus, I use public transportation or taxi only when it is absolutely necessary and walk everywhere instead. This looks relatively straight forward though…maybe now is as good a time to start as any! This routine looks great! Will tryed for sure! 12 minutes almost sounds too good to be true  Have to admit I’m terrible when I’m travelling, usually because we’re somewhere far to hot to do proper exercise and gyms and holidays don’t really mix for me. Yet this does sound like something I could try out…thanks!! At first, I was skeptical about how effective 12 minutes workout could be too. The first week ended with impressive muscle ache to prove how out of shape I was, and the workout was more intense than I thought. With the gradual increase in intensity, by the end of the first month I put my doubts aside. Hi Simone, thanks for stopping by :). Enjoy the workout and have a great trip! Wow this is something I definitely need to try. I find that the idea of a short workout makes it easy to take the first step towards trying to keep fit. Plus this is great for someone like me who doesn’t own a lot of fitness equipment and cannot carry it around on my travels. Thanks for stopping by, Natasha. Surprisingly, it is not easy to find a good workout that is short and does not require any props, which is essential for a long-term traveler. Hopefully, it would work for you too. Just the other day, in an interview I was asked how do you stay fit on your travels. My answer – I don’t. I love discovering the local cuisine, which often translates to being a glutton and I’m not exactly an outdoorsy sporty sort. Your article has come at just the right time, and If someone who is a nomad can do it, I can too! Great to hear from you, Revati. I have no incentives in promoting this program besides just genuinely liking it. I hope it would work for you too.